Bioregional Lists: What has helped you connect to Place? Can you generate a list of 10 things that have proven important bioregionally speaking in your own life, along with a brief explanation/story about why it’s on the list for you? This was the question posted to the Bioreg listserv, an active group which explores many aspects of bioregionalism. Alice Kidd was the first to reply, and I think you will find it well worth your while to read. We will be posting other reponses here, but if you are so inclined, please join the discussion by clicking on the link above and joining the group! And while you’re at it, generate your own list of things and share them with us. You know, those things that made the idea of bioregionalism/local wisdom/ stick to your life as a living thread, what activities, experiences, books, essays, seminars, songs, people come to your mind? Of course don’t feel like you need to stop at 10 items! As for my list, here it is. . .
It’s that trick of perception, when you start to see air-sheds as well as water sheds. Thanks to a couple of mentors, Van Andruss and Fred Brown. Additional features – the sense of being cradled in the earth – flat on your back in complete contact. 2. Exploring the watershed on foot in company, both the journey uphill and the view from the headwaters. Once again, thanks to mentors. First the visceral information, changes in the water and its route, the climb (if any), sightings of animal and bird neighbours, changes in vegetation, the trees. Then, if you are lucky and live in mountains and steep hills, the watershed laid out before you, so you can also see it whole.3. Repeat 1. and 2. with neighbouring and distant bioregions (especially with family and friends). The combination of heart connections with natural history observation brings a powerful clarity. 4. Place Based personal accounts: from Stephanie Mills, Peter Berg, Wendell Berry, Gary Nabhan, Gary Snyder, etc. to William Powers (Twelve by Twelve), Novella Carpenter (Farm City), Brian Brett (Trauma Farm), Stanley Crawford (Mayordomo, etc. ), Robin Jenkins (The Road to Alto), Ray Raphael . . . I can never get enough. My mentor Fred introduced me to “goatness” by pointing out that at first it was Cloud (a beautiful black Alpine doe) who represented “goatness” to me. Then I learned to live with Emily (a Saanen doe with a more difficult temperament). Then we added Becky, Soapalilly, various billies, and so on. You have to experience a lot of individual goats to get “goatness” – a loose overlap of many traits. Definitions are a sign of learning achieved, not the way to learning. I read about other peoples’ attachment to place for their similarities and differences with my own experience – and ’cause they’re fun. 5. Five years on a community trust table for local land use planning. This surprised me. It was personally and politically challenging to face our “oponents” in the war over the forest, at a trust table. We came together as neighbours not enemies, with the goal of listening and observing until we could take on our fellow table members’ issues as our own. Both the issues list and many of the participants were changed in the process, yet I doubt many people felt “compromised”. We spent untold hours poring over maps, listening to scientific and economic reports, travelling up all the major watersheds in the district. It was a huge privilege to be able to observe so much of the surrounding territory – and – our range of “views” enhanced the learning. I came away confirmed in the usefulness of “bioregionalism” as an organizing principle, and impressed by the bioregional vision of my former enemies. I also learned to live in the presence of differences of opinion without having to have them resolved immediately, a skill that has been extraordinarily important in the years since. Our bioregion is defined by the territory of the St’at’imc Nation, on both sides of the Fraser at Lillooet and north as well as along the Duffy and Lillooet lake corridors down into Harrison Lake. It took over 20 years before our community received any feedback from slow building relationships . . . but now we share many perspectives on land and actual activities. Landed Indigenous are the quintessential bioregionalists. Talk about living in place . . . The past 3 years I’ve been privileged to teach algebra in a tribal college prep program. I’ve been teaching and tutoring one-on-one for many years, but with a succession of classes it has become apparent which of the concepts challenge them culturally and which are a legacy of bad schooling. So now I teach graphing after grounding it in a brief introduction to mapping and GPS systems. We talk about actual locations (berry picking spots, for instance) and how different systems allow people to get back to the source – stories, road directions, map grids. I teach polynomials as taxonomy, based on their course in biology. At the same time, I’ve learned so much from my students – I’ve had to – to understand their experience of “abstraction”, of “general principles”. How do they hold memories? How do they generalize? How do they learn? It’s like the difference between being born into a belief system and learning it as an adult. They hold these views as a birthright, I’m the convert. 7. Going back to my birth bioregion. I now live 3000 miles away from my birthplace, in a totally different landscape (although the dates of first and last frost are surprisingly the same). After 10 years away I returned for about 8 months. In the meantime I had added the bioregional perspective to my toolkit; travelling through my birth territory with those lenses was extraordinary, bringing back memories and understandings buried in my childhood. Ten years after that I attended a regional congress at a site well-known in my childhood (for fun times). The overlay of the old memories, the new experience, plus the bioregional concepts learned in a different landscape kicked in quite a learning curve. Lots of fun, too! Bioregionalism is one of the lenses I wear most often, but I wear others. There are a huge number of people today writing about “ways of seeing” that can inform the bioregional vision, and are necessary to it. And bioregionalism informs other fields. There is nothing quite like experiencing mammalness, or kinship with birds, or plants. I’m still reaching for my insect kin – just so you know it can be a stretch and a lifetime task of expanding your own “family”. CBC III near Squamish was thrilling with groups of human birds flying across the meadows. Texas brought a Council of All Beings – another high point. We’ve recently moved to a wider sky, and a bird place. I’m used to singletons, pairs and families, to ducks and corvids. Now we’re watching flocks of all sizes, the locals and the migrants. This is crow territory; the ravens and eagles stay high – and beautiful to watch. Once you have the platform, the perspective, everything adds to it. You get a taste for it, and a capacity to learn quickly. Bioregional culture is way more interesting that global culture – to me. It’s different everywhere you go. There’s always some new surprise. And the connection between the form of the land and the form of the culture always draws my curiosity and interest. I finally learned to appreciate spirituality singing with my community in my home place. Ready to do the work you love for a living, make a career shift, infuse your current job or organization with renewed vision? Several of us have created a landmark event for writers, musicians, songwriters, performers, workshop facilitators, counselors and clergy, activists and community leaders and those involved in or ready to start projects, businesses or organ intensive is focused very much on the nuts and bolts — marketing without selling your soul, business planning with integrity, mindful ethics, community program development, creating workshops and consultation services, fundraising, fund-earning and grant-writing — as well as on conversing with our calls to live in greater balance with our true selves and our community and eco-community. The Right Livelihood Institute will be held June 5-10, 2011 at Unity Village in Kansas City, MO., with most of our activities taking place in one of the first green conference centers in the country. Unity itself is a model of ecological right livelihood, growing as much food as possible on site for meals, and contributing to the health of the greater community. Become part of an ongoing community sharing guidance. Gain a mentor matched with you for your specific needs and visions. When I first discovered bioregionalism, I didn’t realize the parallels between it and progressive education, which I would encounter a decade or so later when I started teaching at Goddard College. Progressive education is based on learning what you need to learn, based on how you learn, with a strong focus on personal and social relevance, and student-centered, hands-on learning. Bioregionalism is, at me at least, at its heart about learning how to live in a way relevant to our places and communities. Both bioregionalism and progressive education are ecologically-based to my mind, looking at our role as part of a larger system, community and planet, and what we need to do to live with meaning and integrity in our lives. Furthermore, yoga is a practice that puts us squarely in the part of the planet most local to us: our own bodies, and then helps us learn what it is to live here. In this spirit, I wanted to share an interview my boss, Ruth Farmer, gave to The Magazine of Yoga about real learning, the importance of skepticism and trusting the process, tinkering and leading, progressive education, and what all we do at Goddard College in terms of holding the space for people to ask their most relevant questions and quest toward answers. See Part 1 here, and Part 2 here. Ruth discusses some of the specific programs at Goddard — particularly the BFA in Creative Writing, and Individualized MA — but moreover, she and Susan Moul, the interviewer (and co-founder of The Magazine of Yoga), and herself a Goddard graduate, talk about real learning, and how to find what meaning we can and need to forge out of our studies, art, work and life. This is also obviously applicable to learning about our place, our bodies, our communities. You can learn more about Goddard here, and see more wonderful articles at The Magazine of Yoga here. (I also write a weekly column on yoga, being a body, and poetry, including bi-weekly poems and writing prompts). Enjoy! Being a sweat lodge runner since 1979 or 1980, a privilege and responsibility passed to me by Melvim Chiloquim, elder and sweat lodge runner from the Klammath nation, and a peace pipe carrier, a privilege and responsibility passed to me in 1988 by a Council of elder women from many different traditions at the sacred Mayan center of Chichen Itza, being myself a mestizo man with an heritage of mixed French, Afro-Cuban, Mexican, Mayan, Spanish and Dutch blood lineages, I reclaim the right to learn in respect from all the traditions from these and other unknown ancestors, and I reclaim too the right to mix in respect the prayers, ways, songs, dances, medicines, stories, myths, prophecies, ceremonies, from all those and other cultures. As an earthman and as a planetary human being, I reclaim my rights to inherit the traditions of all the cultures from the Earth, from the past, present and future, and to continue serving in all respect and humbleness the Mother, humanity, all my relations, for the purpose of the betterment of all living beings. As bioregionalists we are committing to the place where we live, but probably no one of us can trace their belonging to that specific bioregion for more than three, four of five generations. Especially in the Northern hemisphere. We all came from somewhere else, and we have a history of past mixed marriages in our lineage, that probably are unable to trace down after two or three generations. First nation people are also the result of the mixture of different people and different cultures, through centuries of mixed marriages, through wars, through colonization, through forced or voluntary immigrations, and therefore, today, probably noone, or maybe just a 0.001 % (if much) could claim not to have had ever any contact with any other culture. As planetary beings today, we can sit and meditate in respect as the oriental people did for millennia. We can celebrate in respect religious fests from Christian, Jewish, Muslim, African, Indigenous or pagan traditions, use digeredoos from aboriginal people, dress with feathers and clothes from all the cultures on Earth, dance circular peace dances from the four directions, pray with native, Yoruba, Asian or Celtic, drums and blow the conch shells coming from the Tibetan, Mayan or Aztec traditions. The mixture of human cultures is the sign of richness, a richness that is reflected in Nature, especially in places where beings from the plant, animal, mineral world coexist, and take from each other with more abundance. Monocultures and desertification are signs of poorness. And people and cultures that did not mixed for centuries with others, declined and ended up disappearing. The importance to preserve the specific elements from each culture, or from species in danger of extinction, has to do with the possibility that those elements do not get lost and our planet becomes each time poorer and poorer. On the contrary, the importance of preserving is to allow that those elements become part of all of us, enriching our lives, and creating a true planetary culture of peace, instead of a global supermarket with a large selection of merchandises. The unfortunate decease from those people in a sweat lodge has probably to do with the process of global mercantilization and has nothing to do with the respectful appropriation from elements of one or another tradition. And that yes, has to be closely observed. When spirituality, any form of spirituality becomes merchandise, then, yes, we can say that its essential purpose has been distorted. But that can also be considered true for all religious practices. It is not only the problem of adopting elements from Native American ceremonies. It is true for the process of turning ANY element of any spiritual practice (or any teachings or cultural traits) into merchandise. Should we stop doing Christian ceremonies, as they all come from the Palestinian Semitic cultures from the Middle East? Should we stop talking English, if we come from Cherokee, Lakota or Apache ancestry? Should we stop celebrating Independence Day, Christmas, Carnivals, Thanksgiving, New Year´s Eve, festivals who are the result of many rituals that take their inspiration from other previous more ancient traditions? Should we stop dancing in circles around the fire and singing chants from all proveniences? As far as I know, people have died in sweat lodges here in Mexico, in Spain, in Bolivia, and maybe in many other places as well. We do not have a record of how many Native people died in sweat lodges through the centuries that this particular ceremony has been practiced. Others died in their vision quests. Or at Sundance ceremonies. People die going to Mecca, people die in catholic pilgrimages, people die in mosques, Tibetan temples, Hindi temples, people die at Candomble, Umbanda, Santeria, voddoo or any sort of Afroamerican rituals, people die climbing or falling from the temples of the Mayan cities…. People die doing yoga and stopping their respiration. People die. AHO!!! I wish we could have other issues more pressing to focus our time, visions, energies, and purposes. Let’s not buy into the stories the global media wants us to spend our lives. Let’s use our lives to further bioregionalism, yes, but not fundamentalism from any sort. Bioregions are organs, members, bones, blood, tissues from Gaia, Tonantzin, Pachamama. We are born by accident in one bioregion, but we are ALL Earthians, Earth People, Planetary Beings, children from the same Mother. Let’s never forget it please. My love to you and to all our relations! have just returned from the Tenth Continental Bioregional Congress at The Farm in Summertown, TN. The Farm is an intentional living community which began in 1971 as an experiment in communal living when over 300 hippies, members of Stephen Gaskin’s Monday Night classes in San Francisco, formed a caravan and traveled across the country to settle in Southern Tennessee. You can read a fascinating history of The Farm here. The Farm today is home to such organizations as the Ecovillage Training Center, Gaia University and Plenty International. It was a natural fit to locate the Tenth Continental Bioregional Congress there, since the Farm shares myriad goals and values with bioregionalism. New Society Publishers’ roots are deep in the Bioregional Movement, and this was an exciting opportunity to meet old friends and new. I was especially thrilled to connect with a couple of our authors there. Albert Bates is the author of The Post-Petroleum Survival Guide and Cookbook and the director of the Ecovillage Training Center at the Farm, where he has lived since 1972. Albert has a formidable grasp of all things renewable and sustainable, and the distinction of having one of the friendliest smiles it has ever been my pleasure to encounter. Lately he has been focusing on biochar – watch this space next week for his article on using biochar in carbon farming which was recently published in Southern Tennessee’s Green Living Journal. I was also very excited to finally meet Stephanie Mills in person – Stephanie wrote Whatever Happened to Ecology? and Turning Away from Technology, and is also the author of an upcoming biography of Bob Swann which we will be publishing in our Spring season. Stephanie was an incredible pleasure to spend time with – she is one of those people that feels like an old friend even though you’ve only just met. She recently received an honorary PhD from her Alma Mater in recognition of her lifetime body of work in the service of the environment and bioregionalism – exciting news! The Congress itself was a cauldron of inspiration and ideas – people talking about permaculture, renewable energy, carbon farming, square foot gardening, foraging, wild farming, education, transportation, living in community, living in place, political revolution – a rich and vibrant tapestry of knowledge against a backdrop of song and celebration. Interested? Bioregional events are regularly organized at the local and regional level. Check out the Congress Outreach Page and Links Page for ideas about contacting like-minded individuals or creating events in your area. Getting set up in coffee shops to do my normal Goddard and workshops and readings and other arranging work, I can barely imagine what to say to friends about where I’ve been except, “in a parallel universe.” The congress itself is something out of o ur mainstream American, or even alternative American construct of time and space. What happened there? I’m not sure although I have some hope that telling you about it will help me know more. Where were we? In some place constant and occasional, ancient and ahead of its time, ceremonial and ordinary, Tennessee and beyond Tennessee. In many ways, the road trip to the congress — all 10 hours of driving plus numerous stops — meant t unneling into the world in the center of the earth, and now we’re out again, back to the surface, and I have to say I’m just a little heartbroken to be apart from the congress and all of you who were there (as well as all of you who have been there and simply must be there next time and haven’t yet been there but will be there in the future). happiness that settles on us, or grabs us wildly to leap out of our chairs and salsa dance even if we don’t know how. The congress is my home — I kn ow it when I’m there, and especially when I’m not anymore. The circle if the room where I live best. Hearing each person speak — whether in the opening circle when we crowded into the big room, lopsided and earnest, saying our names and where we were from, or later in the spiral of the women’s circle, when we spoke about being a woman, living as a woman’s body at this age — shows me who we really are together, and who I am apart: a part of the circle. * Latin Night with the amazing dancing and treats, the music and pulse, the beauty and vitality. Arnold, Roberto and Maria doing a salsa dance skit with finesse and beauty until Juan-Tomas tangoed in to steal away Maria. slide of the playground (part of where the dance was) in full-beards and layers of white tull. names again, hugging them and telling them to come stay with us sometime when they’re were traveling through Kansas. * Some of the plenaries when everyone laughed together, when we crossed over to some common and complex understanding as one, when barriers dissolved and we saw ourselves as being in congress together continually, this meeting a continuation of one that began in ‘84 and will never end, I hope. * A circle of those of us who served on the coordinating council — the congress between the congresses — for the last four years, early evening, our chairs and bodies as close as possible, tears and joy, pride and release, and when we stood up, holding each other close, and could barely stop kissing each other. Thank you, Bob, Liora, Mary, Richard, Ken, Laura, Juan-Tomas. * Late nights in the house we rented with our extended family, speaking English, Spanish, German (although most of us only understood English), and laughing over something that happened or would happen. * Cultural Sharing night when Natalie sang “Bewitched” and — what was his name? — played the most amazing finger-piano-type instruments and sang hauntingly piercing tunes — and then Alberto presented a dazzling — for its scope and depth — slide show on LaCaravana (nomadic guerilla theater troupe that spent 13 years spreading bioregionalism through the arts througout Central and South America). * The close moments with new and old loved ones — I put my hand on so many people’s chests, it seemed, to feel their hearts — in the rain or by the fire, in the midst of drumming or in the wind that poured through the trees. * Hanging out often with Stephen Gaskin who kept reappearing because, as he said, he “wanted to soak in the energy of the Mexicans,” and who kept reminding Laura Kuri and me that we were his Ninja Muses because when he first arrived, looking just a little confused, Laura and I leapt up and hugged him, and stood — one of us on each side of him — during the opening circle, telling him we would protect him as Ninja Muses. * Gary’s healing hands and voice, and how many of us did he work on throughout the congress? I hardly saw him not doing massage, energy healing or prayer for/with someone. 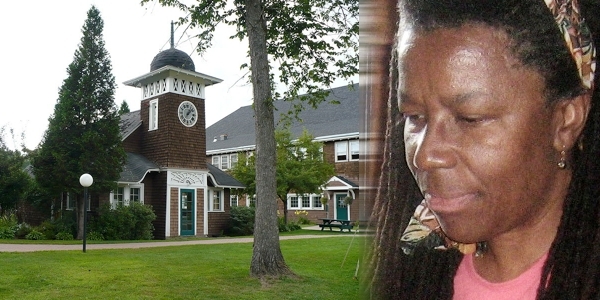 * Bea’s artful presentation about Thomas Berry at the memorial service held one afternoon. David Haenke throwing his head back and belting out the most gorgeous song for Thomas Berry, and soon after, David and Alberto pressing their foreheads together, crying over the loss of this great and enduring spirit, our own dream of the earth. * Alberto telling the story of how LaCaravana went for 13 years all over South America, and instead of money, they used art because, as Alberto said, sometimes there’s no ATM machine, but there’s always art, and art works as a credit card wherever you go. * Biko drumming us in parade to begin the arts and education day of the bioregional curriculum session, and at the end, drumming us outside to dance among the trees while Odin drummed alongside him. When the first song was done, and Odin started to walk back to the building, Biko called out, “Where do you think you’re going?” while we watched, laughing. Odin came back, and they played more of the most astonishing drumming, grabbing our heart beats and making us dance and pulse with life. * Walking back to the house one afternoon, the whitish horse watching me as I watched him, the sky still damp and beginning to lighten in orange at its edges, the air delicious. her whole face glowing — at the dinner table with Alberto, Laura and Fabio. * The beautiful site committee and how much they did to make it all work: Greg, Jennifer, Susan, Alayne, Biko, Roberta, and (forgive me, I can’t remember all the names) so many others: THANK YOU! * Long talks with Patricia, Stephanie, Laura, Fabio, Greg, Stephen, Bea, David in the road, Alberto on the fly, Juan-Tomas as we walked in the dark with Natalie one night, and so many others. I miss and love you — and really everyone — now so much. together — even just a fraction more — into wherever we land. Wherever we are next — in the Northwest or Canada or Ohio or wherever else — I can barely wait. Pictures (from top): the congress; the woods at the Farm; Juan-Tomas, Bob, Stephanie, Andy, Albert; Natalie and Nyela (Sadie’s baby); Laura and Helen (from Mexico); Natalie as cat; the fairies arrive on All Species Night; more All Species (note the porcupine); Bea and me; Gesa; Mark, Richard and the bioregional quilt (started in ‘84, quilted by the men); Fabio and Laura with Stephen Gaskin; Ken, Curtis and others; David and Alberto; Leonor from Venezuela; Stephanie and me; the welcome tent; Gary working on Alberto. Bioregionalism is the idea that our cultural and political adaptations should fall consciously within the natural boundaries of our home on earth. Much of the emphasis of bioregionalism has taken the form of community organizing to bring local food to your table and re-ignite indigenous wisdom that remind of us of our deep sense of place and peace on earth. Now, as we stare down the barrel of another big economic bubble taking form as “the green energy economy” bioregionalism offers us a glimpse of of social, technological and economic development that does not lead to a burst bubble ten years down the road. Bioregional energy designs call for localized, energy that comes from multiple sources. This kind of diversity leads to long term resilience. An example of this would be a county or state that had invested in wind, hydro, biomass, and solar energy sources to power the cities and industries of the region. However, energy technologies are only half the story. The other half lies in grassroots, democratic control over the energy sources. Organizations like Coop power in the North East USA are leading the way in organizational designs that empower citizens of a bioregion with decision making power over their electrical utilities from production to usage. This is kind of participation relies on informed citizens with a deep interests in their homes. Participatory, bioregional energy systems can keep our communities strong and our environment vibrant for generations. 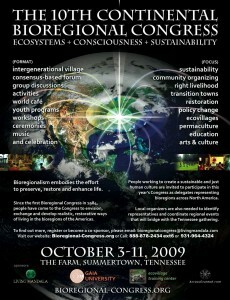 Citizen groups, energy consultants and activists will be gathering here, in the Cumberland Green bioregion for the Tenth Continental Biroegional Congress to create a ceremonial village to discuss collaborative next steps for bioregional energy, food, water culture and beyond from October 3-11th on The Farm in Summertown Tennessee, placing Lewis County at the Forefront of the conversation that is leading North America and the world towards a greener, healthier tomorrow. The Bioregional congress is a living example of a participatory, democratic village. The congress, made up of volunteer delegates from the four corners of the North American Continent, meets in plenary sessions and forms working groups to cover issues brought up by the delegates and their bioregional constituents (including honorary representatives from the plant and animal kingdoms who lack a voice in our current political system). During before and after these plenary and break out sessions there is open space for workshops coving a wide range of ecological wisdoms, techniques and ideas to help cross pollinate best practices between bioregions. The intention of the Bioregional Congress is to create a forum where all voices can be heard, and model the kind of resilient, participatory society we would like to create. This Congress will model sustainability by using local food, sustainable energy and off setting its carbon footprint, and that of its delegates by planting trees are participating in a carbon offset plan designed during the 1st ever Carbon Farming Course set to take place from August 25th- September 16th. The human energy being gathered and unleashed can be seen as a beautiful metaphor for the next steps needed to turn the new green bubble into something substantial: the shift from a culture of passive acceptance to a culture of participation. If you are interested in participating in the discussion and ceremonial village during the Bioregional Congress please email cbcx@thefarm.org or visit bioregional-congress for more options. 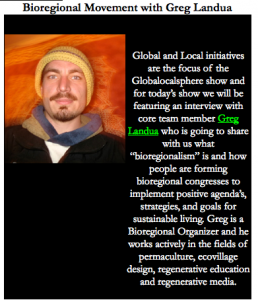 A podcast with Gregory Landua, Site Comittee Coordinator for the upcoming Bioregional Congress, and the Interdependent Radio Project. Un creciente numero de personas esta reconociendo que, para garantizar aire puro y el agua y alimentos que necesitamos para vivir saludablemente, se requiere que nos convirtamos en los encargados de proteger y restaurar los lugares donde vivimos. Cada vez mas nos afecta no conocer a nuestros vecinos ni al entorno natural que nos rodea, y vamos reconociendo que la mejor manera de protegernos a nosotros mismos y conocer a nuestros vecinos, consiste en proteger y restaurar nuestra propia región. La tierra – plantas y animales – arroyos, ríos, lagos, mantos acuíferos y océanos – el aire – nuestras familias, amigos y vecinos – la comunidad – las tradiciones autóctonas – los sistemas indígenas de producción e intercambio. Es hora de reconocer las posibilidades que están aquí, en nuestro propio terruño, comprenden todo un acervo diverso que abarca el ambiente local, su historia y las aspiraciones comunitarias para lograr un futuro sustentable. Se apoyan en fuentes renovables y seguras para obtener alimentos y energía. Aseguran empleo, al promover una rica diversidad de servicios generados en la propia comunidad, reciclando los desperdicios y fomentando los intercambios prudentes con otras regiones. El Biorregionalismo procura satisfacer las necesidades locales de trabajo, educación, salud y autogobierno. La perspectiva del Biorregionalismo crea una actitud ampliamente compartida de identidad regional, fundada en la percepción critica y renovadora del entorno y en el respeto por la integridad de las comunidades ecológicas que lo constituyen. enriquecer el conocimiento local y planetario de nuestros niños. Nuestra seguridad ecológica empieza con el actuar responsablemente en nuestros hogares. was essential to develop bioregional tools that could transit what we’ve learned and what we have to offer for a vividly-changing world. The need has only grown in the last four years. VISION: Our vision was to develop something akin to the permaculture certification — perhaps an 80-100 hour curriculum comprehensively embracing bioregional theory and practice, and set up in such a way that local communities could infuse the curriculum with local wisdom and traditions. PROCESS: Our process was to first develop this in collaboration with the Coordinating Council, and representations from the next congress’ site committee, and then widen the circle to get input from people like you! After May 15, 2009, we will share this blog page with the larger bioregional listservs, websites and social networking sites to help raise energy for the next congress and for the curriculum. WE SEEK YOUR INPUT: We ask you to visit http://Biocurriculum.blogspot.com, where you can see the goals for the curriculum, the curriculum structure, a draft for piloting a 16-hour introduction to the curriculum at the next congress (Oct. 3-10, 2009 at The Farm — www.Bioregional-congress.org), and questions for expanding this curriculum to an 80-100 hour program in the future. Note that the structure for both the short and longer curricula will be the same–just more details and place-specific information will be added to the longer version. We know that many of you have vast experience in bioregional, social ecological, environmental and related education, and we humbly ask for your suggestions, clarifying questions, feedback, etc. FUTURE DEVELOPMENT: Once the 16 hour curriculum is piloted at the next congress, and while it’s being piloted, all interested people (including any and many of you, we hope!) can meet to help us further develop the full curriculum, and then the infrastructure to carry it out into the world and seed it widely, including ways it can be widely offered through many organizations, individuals, institutions and communities. We seek to create a curriculum that would dovetail with and/or build on some of the work many of you are already doing in bioregional education as well something many of you can integrate into your educational offerings on bioregionalism. At the website — www.Biocurriculum.blogspot.com — you can leave comments, or you may email any comments to us at this email (Caryn will pass all comments onto the curriculum committee). And if you would rather share your comments by phone, just drop Caryn a line, and she’ll call you. Letters are also welcome: 1357 N. 1000 Rd., Lawrence, KS. 66046. Bioregional Congress is powered by	WordPress 3.6.1 and delivered to you in 0.161 seconds using 45 queries.